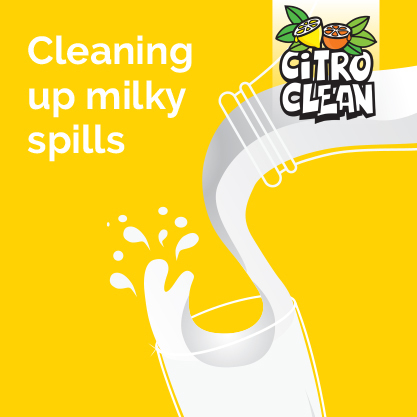 Dont cry over spilt milk, Simply clean and freshen with Citro Clean. The important thing to remember with a milk stain is the longer you leave it unattended, the worse the smell will get. If the spill is fresh, and on carpet, soak up as much as possible, without scrubbing. Blot the stain. Mix two cups of water with 1 teaspoon of Citro Clean and gently blot the stain, after spot checking your carpet. If a milky smell persists, pour some baking soda over the stain overnight, spray the baking soda lightly with some Citro Clean. vacuum the next day.